Young Latino adults in the United States are more likely to be in school or the work force now than their counterparts were in previous generations. In 1970, 77% of Hispanics ages 16 to 251 were either working, going to school or serving in the military; by 2007, 86% of Latinos in this coming-of-age group were taking part in these skill-building endeavors, according to a comprehensive analysis of four decades of Census Bureau data by the Pew Hispanic Center, a project of the Pew Research Center. The growth over time in the share of youths involved in such market-oriented activities is not limited to Latinos. Similar changes have occurred among black and white youths. But the Latino trends are particularly noteworthy because their share of the young adult population has risen so dramatically during this period—to 18% in 2007, more than triple their 5% share in 1970. The increase in their attachment to school or the work world (which includes employment by the military) has been driven mainly by the changes in the endeavors of young Hispanic females. In 1970, only one-third of young female Hispanics were enrolled in school or college; by 2007, nearly half of young female Hispanics were pursuing schooling. The labor force participation of young female Latinos has also grown during this time period, from 40% in 1970 to 54% in 2007. Even with these gains, however, nearly one-in-five (19%) female Latino young adults in 2007 were not in school or in the work force. This figure exceeds the 16% share of young black men who were not in school or in the work force, a surprising comparison in light of the fact that the labor market and schooling difficulties of young black men have received much more public attention than have those of young Hispanic women. In the case of young Latinas, motherhood accounts for some—but not most—of their detachment from work and school. Birthrates among young Latino women are higher than those of whites or blacks, but these rates have been falling for decades. In 1970, two-thirds of the young Hispanic women who were not in school or the work force were mothers; by 2007, this share had dropped to less than a majority. Looking more broadly at the changing pathways into adulthood across all dimensions of race and ethnicity, Hispanic youths (young men and women combined) lagged behind white youths in 2007 by about the same gap that their counterparts trailed whites in 1970. 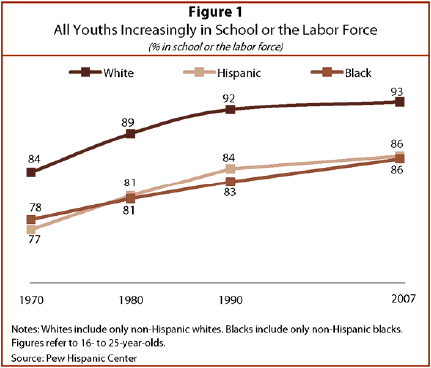 In 2007, 93% of white youths were either in school or working, compared with 86% of Hispanic youths. As Table 1 shows, Hispanics also had a lower school enrollment rate (44%) in 2007 than either white (58%) or black (53%) youths. The labor force participation rate of young Hispanics in 2007—62%—also trailed the rate of white youths (66%), due to the lower labor force participation of young Hispanic females. Meanwhile, engagement rates for Hispanic and black youths were identical in 2007 (86%), and they were also very close in 1970 (77% and 78%, respectively). The growing attachment of Latino youth with school and work comes during an era of dramatic changes in the U.S. economy. For those without a college degree, the pathways into middle-income status appeared to vanish with the rapid loss of manufacturing jobs.2 The income gap between those with a college degree and those without increased steadily from the 1970s onwards (Pew Research Center, 2008). This report analyzes the changing pathways of Latino and other youth into adulthood from 1970 to 2007. In addition to exploring their school and work patterns, it reviews trends in military service and incarceration among young men. For young women, the report also focuses on motherhood. Young Hispanics’ growing pursuit of schooling since 1970 has occurred at both the secondary and postsecondary levels. Hispanic high school dropout rates have sharply declined since 1970, when more than one-third of young Hispanics were high school dropouts. By 2007, fewer than one-fifth were dropouts. College enrollment has also expanded among Hispanic youths. In 1970, only 25% of young Hispanic high school completers were enrolled in college at the time of interview. By 2007, almost 40% of Hispanic high school completers were pursuing college. But white and black youths are also increasingly staying in school and attending college, and Hispanic youths continue to trail white and black youths in school enrollment. In 2007, for example, 19% of Hispanic youths were high school dropouts, compared with 10% of black youths and 5% of white youths. The most notable development is in the increase in labor force participation—share of young adults at work or looking for work—among women. In 1970, 40% of young Latino women were at work or looking for work (whether or not they were also enrolled in school or college). That share rose to 54% by 2007. Among young Latino men the labor force participation rate increased from 65% in 1970 to 68% in 2007. Male Latino youth are active in the labor force at the same rate as male white youth and the share of either exceeds the share of male black youth. However, in spite of the increase in labor force participation by young Hispanic women, they continue to have the lowest rate of labor force participation of all the race/gender groups examined. Young Hispanics’ growing pursuit of school or the work world since 1970 reflects changes in patterns of marriage and parenting. During this period, young women, including young Hispanic women, have grown less likely to marry during their youth (Landale, Oropesa, and Bradatan, 2006). They have also become less likely to be mothers. In 1970, 35% of young Hispanic females were mothers. By 2007, only 21% were mothers. Young mothers are less likely than other young women to continue their schooling. As young motherhood has waned, young Hispanics’ pursuit of market-oriented pathways has grown. One pathway into adulthood that has significantly diminished for young Hispanics is military service. In 1970, at a time when a military draft was in place, 5% of young Hispanic males were in the armed forces. By 2007, only 1% of young Hispanic males were in the military. White and black male youth employment in the military has also declined since 1970. For example, 2% of young white males were in the armed forces in 2007, down from 8% in 1970. A pathway that has grown more common over time—albeit from a small base—is prison or jail. By 1990, about 2% of Hispanic youths were incarcerated, up from less than 1% in 1970. There has been little change in the incarceration share since 1990. The share of white youths incarcerated has remained about 1% since 1970. Black youths incarceration peaked at about 5% in 2000 and has since declined to 4% in 2007. The sharp growth in the Hispanic share of this 16 to 25 age group has been driven by a combination of high immigration levels and high birthrates among Latino immigrants. These trends in turn have altered the demographic profile of Latino youths. The white and African-American youth populations continue to be largely native born. In contrast, the origins of Latino youths have shifted since 1970—not once but twice. In 1970, only one-third of Hispanic youths were foreign born. By 2000, almost half of Hispanic youths were immigrants. Since then, the share of Hispanic youths who are foreign born has receded (to 39% by 2007) as more Latino young adults are the children of the immigrants who arrived in the 1970s, 1980s and 1990s. This report was prepared for the Education Writers Association, Pew Hispanic Center and National Panel on Latino Children and Schooling conference entitled “Latino Children, Families and Schooling.” The conference was held on Tuesday, October 6, 2009. This report presents a comprehensive analysis of the basic activities or pathways of Hispanic, white and black youths ages 16 to 25. Using data on youths from the Decennial Census micro data files of 1970, 1980, 1990 and 2000 and the comparable U.S. Census Bureau’s 2007 American Community Survey (ACS), all youths residing in the United States are analyzed and thus the important pathways of service in the military as well as incarceration in correctional facilities can be quantified. All references to whites and blacks are to the non-Hispanic components of those populations. The labor force includes the employed and the unemployed. Those employed in the armed forces are included in the labor force. “Incarcerated” refers to males institutionalized in prisons and jails, hospitals, and juvenile institutions. See Appendix B for details. Richard Fry. The Changing Pathways of Hispanic Youths Into Adulthood. Washington, DC: Pew Hispanic Center, 2009.